Chinese and Vietnamese officials will meet this weekend with maritime security on the agenda. On October 15 at 20:55 GMT the Vietnam People’s Army Online newspaper, Quan Doi Nhan Dan, released the dramatic news that General Chang Wanquan, China’s Minister of Defense, had invited his Vietnamese counterpart, General Phung Quang Thanh, to visit Beijing from October 16-18. This news report was placed unobtrusively among other more mundane reports of activities concerning the Vietnam People’s Army. Nevertheless, the importance of this visit cannot be overstated. General Thanh’s high-powered delegation comprises eleven senior generals and one admiral including Lt. Gen. Bế Xuân Trường, deputy chief of staff; Lt. Gen. Lương Cường, deputy director of the General Political Department; Lt. Gen. Dương Đức Hòa, commander of Military Region 2; Lt. Gen. Phương Minh Hòa, commander of the Air Defense Air Force; Lt. Gen. Võ Trọng Việt, commander of the Border Guard; Lt. Gen. Phạm Hồng Hương, commander of Military Region 3; Admiral Phạm Hoài Nam, deputy commander and deputy chief of staff of the Navy Command; Lt. Gen. Phan Văn Tường, deputy commander Military Region 1; Maj. Gen. Vũ Văn Hiển, director of the Office of the Ministry of National Defense; Maj. Gen. Vũ Anh Văn, commander Communications and Information; Maj. Gen. Vũ Chiến Thắng, director of the External Relations Department of the Ministry of National Defense; and Maj. Gen. Ngô Quang Liên, deputy Minister of National Defense. In addition, the visit was also aimed at creating public awareness of issues affecting international and regional security in each country in order to contribute to the development of the comprehensive cooperative strategic partnership between China and Vietnam. Specifically, the high-level meeting between Chinese and Vietnamese military leaders was to reach agreement on a Memorandum of Understanding on direct technical communication links (hot lines) between the two defense ministries. It should be recalled that during the oil-rig crisis earlier in the year (May-July), Vietnam unsuccessfully sought to activate a hot line with its Chinese counterparts. The composition of the high-level Vietnamese military delegation reflects Vietnamese concerns, first expressed by General Thanh at this year’s Shangri-La Dialogue in Singapore in the midst of the oilrig crisis, that both sides should exercise restraint and exert tight control over forces under their command to prevent incidents from spiralling out of control. 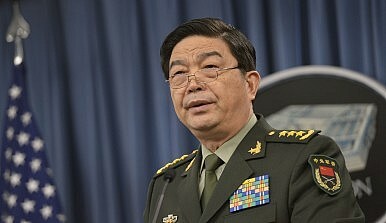 General Thanh, while expressing concern about the risk of armed incidents, publicly downplayed the significance of the oil-rig crisis. He likened it to a family spat and said such conflicts were normal in any family or nation. In Thanh’s view, relations with China were developing well and that the territorial dispute was an exception. The Vietnamese delegation includes senior commanders of military regions 1, 2 and 3, the Border Guard, the Navy and Air Defense-Air Force that are most likely to encounter their Chinese counterparts on routine operations. The Vietnamese side also includes a general responsible for communications. The heads of the two military delegations, Generals Chang and Thanh, are both members of their respective party Politburos. And both serve on their highest level party-military committees, the Military Affairs Committee and Central Military Party Committee, respectively. The current high-level bilateral military-to-military discussions are important because they indicate that both China and Vietnam acknowledge that an accident or miscalculation between their armed forces could get out of control. Both sides appear willing to reach an understanding on how to respond to incidents to prevent their escalation. During the oil rig crisis Vietnam publicly announced on more than one occasion that it was keeping its military forces – navy and air force – well away from the area in dispute. China, on the other hand, deployed People’s Liberation Army Navy ships with the flotilla sent to protect the mega oilrig and flew military aircraft over the disputed area. These forces, however, were not engaged directly in the daily confrontations between Chinese civilian law enforcement agency vessels and their Vietnamese counterparts. Vietnam goes into these negotiations with its hand strengthened by the recent stepping up in defense relations with Japan and India and by the U.S. partial lifting of its ban on the sale of lethal weapons. Vietnam’s relations with China are an extremely sensitive domestic matter, particularly as a result of the oil-rig crisis. Vietnam’s leadership is divided on what policy to pursue. China’s timely withdrawal of its oilrig in July led to the postponement of a Vietnam Communist Party Central Committee plenum scheduled for August. Party statutes require two Central Committee plenary sessions each year. The results of the present visit by a high-level military delegation to China will weigh heavily on deliberations at the next plenum. It is therefore significant that the Vietnamese delegation includes six generals who are also members of the party’s Central Committee.